CatSCAN is in many ways like a lost child in the wilderness - he knows to some degree where he came from, but is unsure as to where he will eventually end up. Brought to life by a bizarre combination of Apelinq and his digitization powers and the artificial intelligence of a medical diagnostic computer, this curious creature has found a permanent home with the Wreckers team. 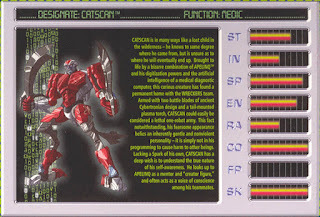 Armed with two battle blades of ancient Cybertronian design and a tail-mounted plasma torch, CatSCAN could easily be considered a lethal one-robot army. This fact notwithstanding, his fearsome appearance belies an inherently gentle and nonviolent personality - it is simply not in his programming to cause harm to other beings. 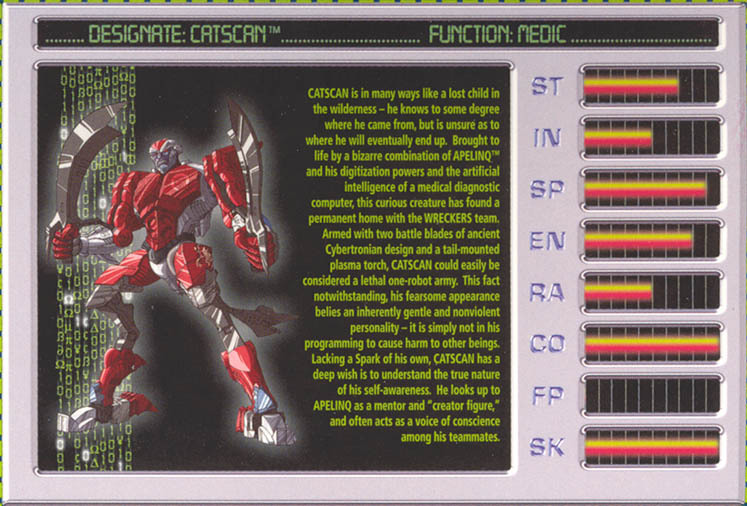 Lacking a Spark of his own, CatSCAN has a deep wish to understand the true nature of his self-awareness. He looks up to Apelinq as a mentor and "creator figure," and often acts as a voice of conscience among his teammates.